Handcuff King. Escape Artist. International Superstar. 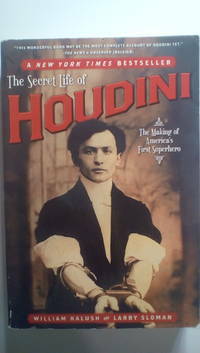 Since his death eighty years ago, Harry Houdini's life has been chronicled in books, in film, and on television. Now, in this groundbreaking biography, renowned magic expert William Kalush and bestselling writer Larry Sloman team up to find the man behind the myth. 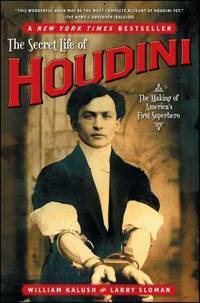 Drawing from millions of pages of research, they describe in vivid detail the passions that drove Houdini to perform ever-more-dangerous feats, his secret life as a spy, and a pernicious plot to subvert his legacy. The Secret Life of Houdini traces the arc of the master magician's life from desperate poverty to worldwide fame -- his legacy later threatened by a group of fanatical Spiritualists led by esteemed British author Sir Arthur Conan Doyle. Initiating the reader along the way into the arcane world of professional magic, Kalush and Sloman decode a life based on deception, providing an intimate and riveting portrayal of Houdini, the man and the legend. Atria Books, 2007. Paperback. Good. Disclaimer:A copy that has been read, but remains in clean condition. All pages are intact, and the cover is intact. The spine may show signs of wear. Pages can include limited notes and highlighting, and the copy can include previous owner inscriptions. At ThriftBooks, our motto is: Read More, Spend Less.Dust jacket quality is not guaranteed. Atria Books, 2007. Paperback. Acceptable. Disclaimer:A readable copy. All pages are intact, and the cover is intact. Pages can include considerable notes-in pen or highlighter-but the notes cannot obscure the text. At ThriftBooks, our motto is: Read More, Spend Less.Dust jacket quality is not guaranteed. Atria Books, 2007. Paperback. Acceptable. Disclaimer:A readable copy. All pages are intact, and the cover is intact. Pages can include considerable notes-in pen or highlighter-but the notes cannot obscure the text. An ex-library book and may have standard library stamps and/or stickers. At ThriftBooks, our motto is: Read More, Spend Less.Dust jacket quality is not guaranteed. Atria Books, 2007. Paperback. Good. Disclaimer:A copy that has been read, but remains in clean condition. All pages are intact, and the cover is intact. The spine may show signs of wear. Pages can include limited notes and highlighting, and the copy can include previous owner inscriptions. An ex-library book and may have standard library stamps and/or stickers. At ThriftBooks, our motto is: Read More, Spend Less.Dust jacket quality is not guaranteed. Atria Books, 2007. Paperback. Very Good. Disclaimer:A copy that has been read, but remains in excellent condition. Pages are intact and are not marred by notes or highlighting, but may contain a neat previous owner name. The spine remains undamaged. At ThriftBooks, our motto is: Read More, Spend Less.Dust jacket quality is not guaranteed. Atria Books. Used - Good. Shows some signs of wear, and may have some markings on the inside. Atria Books. Used - Like New. Ships from Reno, NV. Book in almost Brand New condition. 100% Money Back Guarantee. Shipped to over one million happy customers. Your purchase benefits world literacy! Atria Books. PAPERBACK. 0743272080 Fast handling - Orders prepared for Shipping Next Business Day! . Good. Atria. Used - Very Good. Light to moderate shelf wear. Complete. Clean pages. Atria Books, 2007. Trade Paperback. Good. Softcover. Sound & good copy, light to moderate rubbing/edgewear to wraps, thumbing wear. Atria Books, 2007-10-02. Paperback. Very Good. Atria Books, 2007. Paperback. Very Good. Almost new large paperback. No spine crease. Only slight wear. Text is clean, unmarked, tight. (Shelf location: CC) All items carefully packed to avoid damage from moisture and rough handling. Tracking included. Atria Books, 2007-10-02. Softcover. New. GREAT Bargain Book Deal - some may have small remainder mark - Ships out by NEXT Business Day - 100% Satisfaction Guarantee! Atria Books, 2007-10-02. Paperback. Good. Atria Books, October 2007. Trade Paperback . Used Very Good. Light wear to cover, creases, slightly bumped corners, pages clean and unmarked. We carry new and used books in our storefront. We want you to be satisfied with your purchase. Please contact us if you have questions regarding this item. Atria Books. Used - Acceptable. Ships from the UK. Shows definite wear, and perhaps considerable marking on inside. 100% Money Back Guarantee. Your purchase also supports literacy charities. Atria Books. Used - Good. Ships from the UK. Former Library book. Shows some signs of wear, and may have some markings on the inside. 100% Money Back Guarantee. Your purchase also supports literacy charities. Atria Books. PAPERBACK. 0743272080 *LIKE NEW* Ships Same Day or Next! . Fine.